Eco-Cyclist a 22 oz Bike Sports Bottle with Wide-Mouth Push-Pull Cap and the RP20D, a 20oz Recycled Transparent Bottle with Drink Thru Lid. Shown here in green, both bottles actually come in a bunch of colors. And you can mix and match lids, as you can with other bottles in the Garyline line up. Also notice that Garyline is now announcing that they can custom mold any of the sport bottles in their line with post-consumer recycled content. That means it is open season over there, regarding additional bottle shapes. Custom molding will take a bit longer, but it does let you find the perfect fit for you marketing need. Take a look at the full Garyline selection at www.garyline.com. 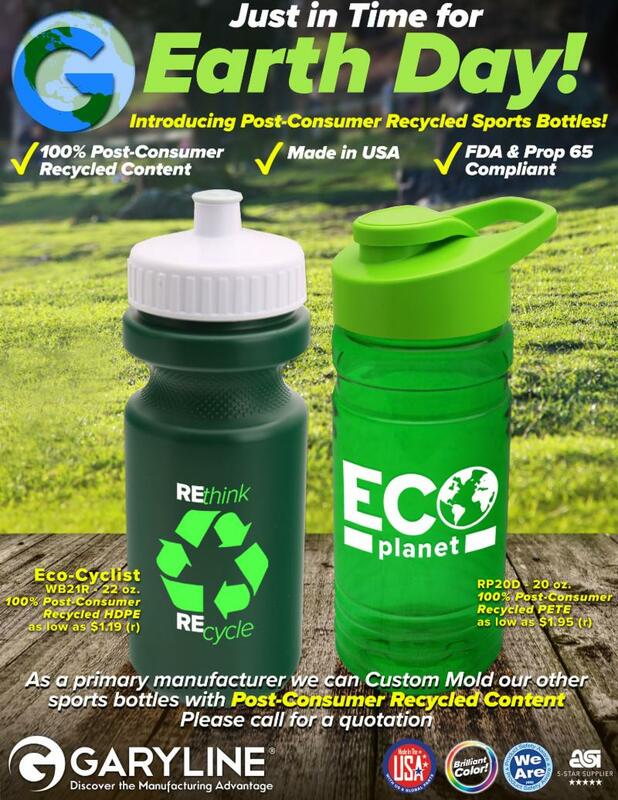 If you are interested in Garyline Post Consumer Recycled bottles to promote your own business, or to get a sample, email info@proformagreen.com for information and pricing. Got a heath and wellness program at your company? Own a gym? Working in the life science arena? 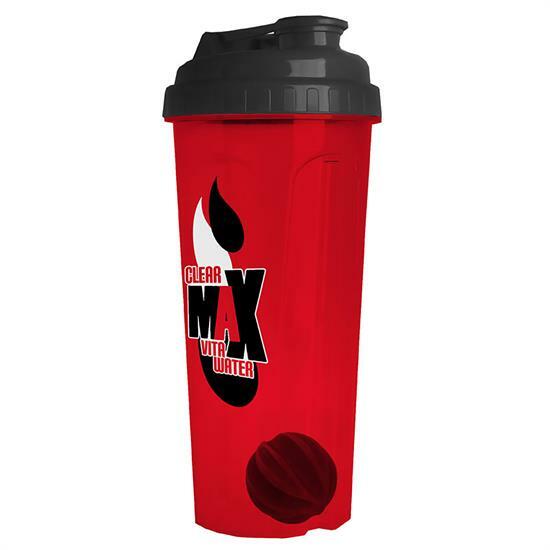 Well then you might be looking for a good blender bottle for your marketing efforts, and for those efforts, can we suggest the 24 Oz Endurance Tumbler With Mixing Ball from Garyline. The 24 Oz Endurance Tumbler With Mixing Ball is a 24oz / 750ml sports cup, featuring a drink thru lid, and, as the name suggestions, carrying a shaker ball. It is a perfect item for fitness programs, or marketers of energy & meal replacement drinks. With a wide top opening for easy filling, and both ounce and milliliter measurements on the sides, the 24 Oz Endurance Tumbler With Mixing Ball, is easy to use, and piratical. This made in the USA bottle is molded from reusable and recyclable polypropylene, and is both PBS free and FDA food compliant. 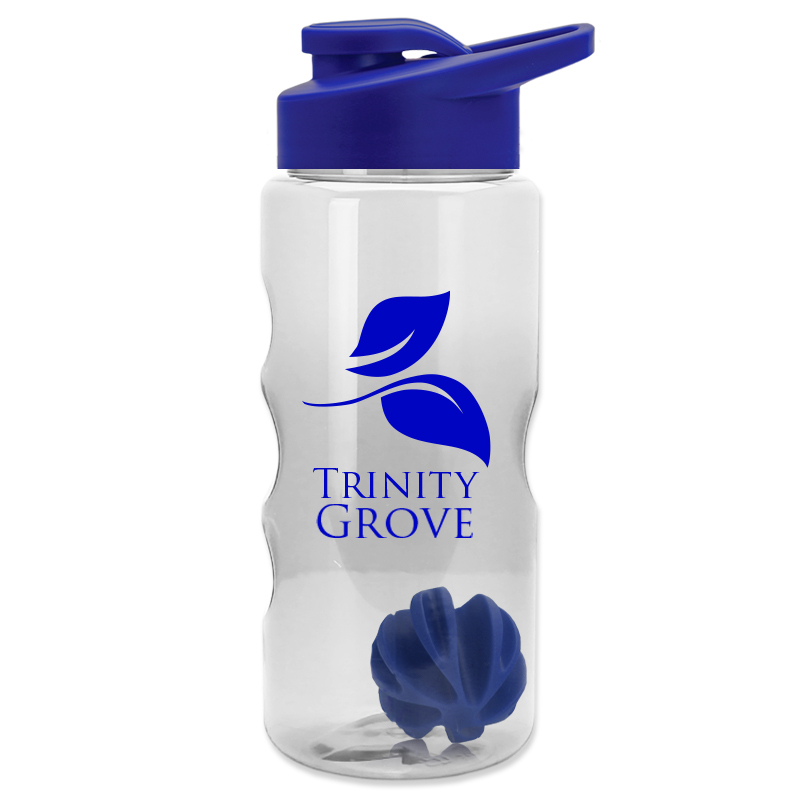 The tumbler body is available in five colors, the mixer ball in nine colors, and the lids in eight colors, allowing for a mix-and-match design palette that will work for most any logo. If you are interested in the 24 Oz Endurance Tumbler With Mixing Ball to promote your own business, or to get a sample, email info@proformagreen.com for information and pricing. The Quickpoint website has a new look, and it looks like some new designs as well. So Quickpoint is continuing their commitment to both biodegradable and USA made items. The BioAd™ Trekker Travel Mug comes in seven great colors (White, Black, Thunderbolt Blue, Sky Blue, Sage Green, and Red). It is fine for both hot and cold liquids, with a 24 .oz capacity. Like the BioAd™ Trekker Travel Mug as an idea for anything from thank gifts for community clean up projects, to trade-show giveaways for the recycling or waste management industries. Plus, they look pretty cool. And, sometime else to keep in mind, the BioAd™ Trekker Travel Mug is lighter to ship, and less breakable, than traditional ceramic coffee mugs. Please ask us to see a sample, we will be happy to send one out. If you are interested in these 100% R.P.E.T. Laminated Grocery Bag to promote your own business, or to get a sample, email info@proformagreen.com for information and pricing. 26 oz. Tritan™ Flair Sports Bottle is molded with food-safe, Dishwasher-safe, BPA Free Tritan™, featuring Drink Thru Lid and Mixing Ball. Great for protein shakes. Fully assembled. Mixing Ball is polybagged with usage and care instructions. New from Garyline is their Tritan 26 oz. Flair Bottle with Mixer Ball. This is a made in USA sports bottle with mixer ball, perfect for sport and gym promotions. The bottles come in 11 colors options, the lids in 9 color options, and the mixer balls in 8 color options. With all those choices it is easy to design a stock Tritan 26 oz. Flair Bottle with Mixer Ball that looks like a custom design. The Tritan 26 oz. Flair Bottle with Mixer Ball is going to be great for any team program, since the color choices will make it an easy match of bottle design to team colors, as well as corporate wellness events, heath fairs, and gyms new membership drives. With a cost as low as $4 a unit, these FDA Compliant, food safe bottles, are a cost efficient, USA made, add-on to your marketing plan. Garyline is also well known for their large line of recycled content drinkware, such as the WB32F – The Sports Quart Flip – 32 oz Sports Bottle. However they do not seem to be currently offering a recycled model of the Tritan 26 oz. Flair Bottle with Mixer Ball. Garyline is a 53 year-old family run promotional items business celebrating with nearly 95% of their production manufactured in their New York facility. The Works exclusive reusable party tumbler inspires nostalgia for the weekend while proudly displaying your brand. The plastic 16 oz. red tumbler is ubiquitous. Any tailgate party, any fraternity bash, any office sendoff, there they are, the red plastic cups, and after, there they go, right into the trashcan. I guess The Works took that fact as a starting point to develop a reusable item that everyone already uses, The Works reusable 16 oz. Party Tumbler. This is a 16 oz.double wall insulated reusable BPA free acrylic tumbler that look just like the classic party cup. The Works Party Tumbler also boasts the neat trick of a matted area on the base on which your party goers can write their name. The Works Party Tumbler comes with an easy to use thumb open lid, and works well for both hot or cold drinks. The Party Tumbler has a large imprint area, with a possible full wrap of imprint size of 3″ W x 6.75″ Wrap. From a marketing perspective what we have in The Works Party Tumbler is an instant souvenir of that tailgating party, that company pool part, that 25th anniversary football game between the big school rivals. Available in red, blue, black, and yellow, this reusable 16 oz. party tumbler is likely to become as popular as its disposable relative. If you are ASI contact Customer Services at The Works to learn more. If you are interested in The Works reusable 16 oz. Party Tumbler for your marketing needs, contact your local promotional items vendor or email info@proformagreen.com for information and pricing. I seem to be writing a lot of articles about foldable water bottles. I must admit I just like them. Foldable bottles are light and easy to mail (unlike most all other drinkware). They are great for travelers, they are great for youth sports. And it seems that vendors just keep coming up with more unique shapes and sizes. Now Points of Light has come out with their foldable T-Shirt Shaped Collapsible Water Bottle. What I really like about this shape is it’s a T-shirt. And therefore any T-shirt artwork that I’m doing for a client can easily be adapted to this bottle as well. Right away have a matching package promotional giveaway. We like the foldable water bottles because reusing a water bottle is of course much better than simply buying plastic bottles and throwing them in the landfill, reusing drinkware is simply more sustainable. And if that drinkware happens to look like your favorite T-shirt, or support your local college team, well maybe that’s just a gentle push for you to be more sustainable. The T-Shirt Shaped Collapsible Water Bottle is BPA Free and meets all FDA requirements. The bottles fold flat for easy storage and come with a coordinating carabiner to attach easily to belt or backpack. The bottles are even top rack dishwasher safe. If you are ASI and wish to learn more about T-Shirt Shaped Collapsible Water Bottle from Points of Light contact Andrea Catalano. If you are interested in natural cotton items to promote your own business contact your local promotional items vendor or email info@proformagreen.com for information and pricing. With a color change to red or green, the HydroPouch!™ 24 oz. Hockey Puck Collapsible Water Bottle is not to far from looking like a holiday ornament. Ok, we all know that the HydroPouch!™, the go anywhere, reusable, BPA-free, sports theme, folding bottle line from Jetline, has been a runaway hit this year. And why not, it is a great reusable item, great for travel, great for youth sports, and Jetline keeps adding new themes, basketball, hockey, football, baseball, tennis, they just keep coming. But something is missing. Notice that aside from the Football HydroPouch!™ and one or two others, nearly all HydroPouch!™ items are round in their basic shape. The holidays, round things, thinking, thinking… oh yes. Jetline where is the holiday ornament theme HydroPouch!™? Can we get that pretty please? We know other companies are having a fun time with holiday pre-prints, like Raining Rose and The Express Line. I think Jetline should think about offering the same idea in the HydroPouch!™ line. Take a circle pouch pattern and give us a few holiday ornament themes to work with. The thing is I have played with the HydroPouch!™. These BPA-free folding water bottles are durable. Also they can hold cold just fine. Indeed a bar client we have asked about using them to serve their signature frozen margarita (with straw) on game days. (The idea was the HydroPouch!™ would go home with the guest as a souvenir of the big game). Point is we froze these guys with margaritas in them and the idea worked. A holiday theme HydroPouch!™ would of coarse work great for the kiddo holiday events, but I really am wondering how a HydroPouch!™ holiday ornament might work with spiked eggnog. It is just a little over 30 days to New Year’s Eve gift bags. Jetline, how about designing a holiday HydroPouch!™. Please? If you are ASI contact Alex Skorupsky at Jetline to learn more about the HydroPouch!™ line. If you are interested in the HydroPouch! line for your own league or team, contact your local promotional items vendor or email info@proformagreen.com for information and pricing. The large double sided imprint on the ELGIN 25oz gives a lot of room for messaging. It turns out that the Elgin 25oz water bottle from the Express Line is Made in the USA. Not really sure how this one got past us because this office loves this bottle. The Elgin is your basic squeeze sports bottle, with a very clean profile. The bottles come in BPA-Free clear plastic or jet black BPA-Free pearl plastic bodies, and Express Line offers a host of color options for lids. The mix of cap options lets designers match art colors to caps for a very retail, very cool looking end product. This USA made, BPA-free bottle has a common threaded, push pull cap, so easy access for adding ice, and easy to open on the go. The only drawback seems to be that it has a maximum two color imprint, however those two colors can be a perfect PMS match if needed. The big plus of course is the huge front and back 6-1/4in x 2-1/4in imprint area, or full wrap of 6-1/4in x 7-1/5in. With an end of the year sale price of $1.99 EQP, that is a lot of billboard for your marketing message on a USA made, BPA-Free bottle. Printing logos to match cap colors on Elgin 25oz gives a very clean, retail look to bottles. Schools, gyms, hospitals, and those marketing programs working around fitness, team sports, and health, are all prime candidates for the Elgin. Also programs needing a low cost USA bottle with a high perceived value. If you are an ASI distributor Jarel Guerrero is the contact to talk to at The Express Line. 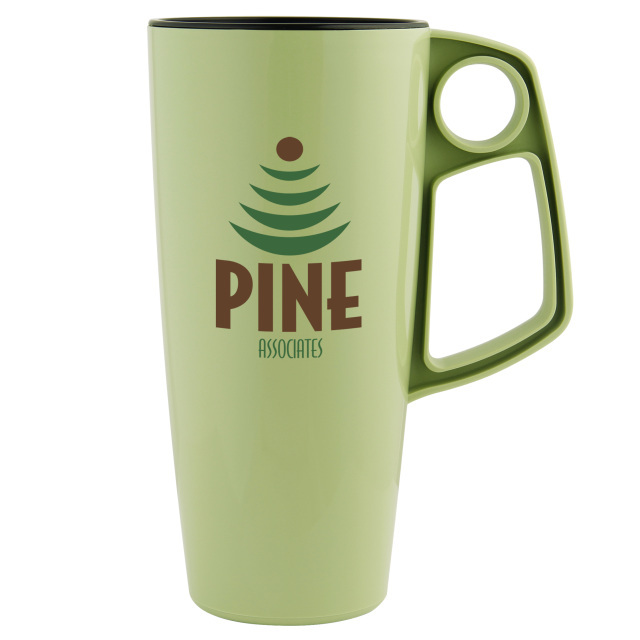 If you are interested in using holiday drinkware for your own business or event, contact your local promotional items vendor or email info@proformagreen.com for information, pricing, and samples. In the sustainable arena it is generally agreed that for reusable drinkware, stainless steel bottles are safer and easier to maintain than aluminum, plastic, or glass. So the question then becomes, which is the better stainless steel bottle to promote your brand or event? For 2012 I am voting for the h2go-v volt from Express Line. This 20 oz. double wall 18/8 stainless steel water bottle is vacuum insulated and features a high impact threaded lid. This vacuum insulated bottle keeps cold drinks cold. It also makes for a slightly heavier bottle, which I see as a plus for a promotional item, as the h2go-v volt has a heft to it that conveys value, strength, and quality, all words that most businesses would like to associate with. To top if off, the Express Line offers the h2go-v volt with an amazingly appealing chrome finish. The chrome finish makes any logo pop brightly and is a much better canvas to your logo than the standard stainless steel natural finished offer on most bottles. But you’re not limited to this wow/bang chrome, indeed the h2go-v volt comes in eight finishes, with bright colors like apple, orange, and fire engine red leading the pack. Express Line will even add a carabiner to the bottle for $0.50. The Express Line offers many, many, many stainless steel drinkware options. I think the h2go-v volt beats them all when judged for functionality, classic design, and flat out coolness. The h2go-v volt is really most appreciated in person, when comparing apples-to-apples with another bottle, so I suggest you get your hands on one before doing any bottle buying in 2012. If you are an ASI distributor Jarel Guerrero is the contact to talk to at Express Line. If you are interested in the h2go-v volt to promote your own business or event, contact your local promotional items vendor or email info@proformagreen.com for information, pricing, and samples.